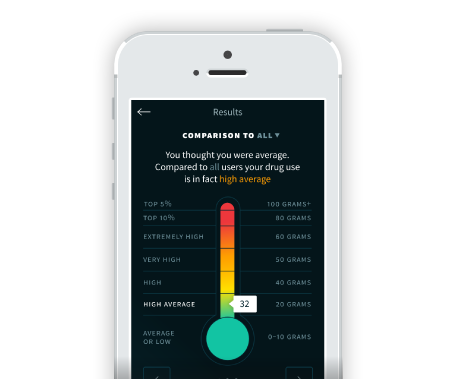 Drugs Meter allows users to see how their drug use compares to other people just like them, offering objective, personalised feedback that takes their personal features in to account. With an overview of total drug use and in depth analysis for nine drugs at present, drugs meter gives objective feedback informed by medical experts. A secure, anonymous web and smartphone app, drugs meter is an independent and isn’t funded by any government. It is committed to giving honest, accurate information. All data is anonymous, secure and cannot be traced back to any individual.